Then I decided to work back from NuForce. I inserted the Pre-9, with the Reference 9 SE driving the Sapphire tweeters and the Reference 9 V2 driving the woofers. 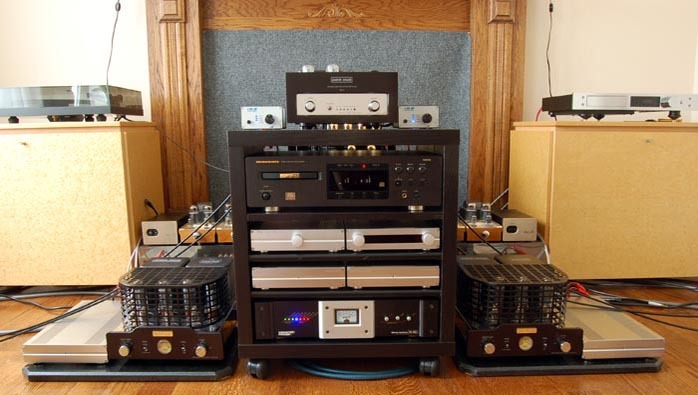 That's the system that worked best for a pianist's ears but perhaps was "not musical enough" for a normal audiophile. If I wanted to tune that to sound a little bit more like tube amps in the higher octaves to please a larger crowd without resolving to the Symphonic Line preamp, what should I do? You might have guessed right away but I was too close to the whole thing and it took me until the next morning to get that light bulb blinking in my head. Yes, I replaced the Reference 9 SE with the Dared VP-20 and later with the Audio Space Nova M-34 to drive the Sapphire tweeters while keeping the Nu Force Reference 9 V2s on the woofers. 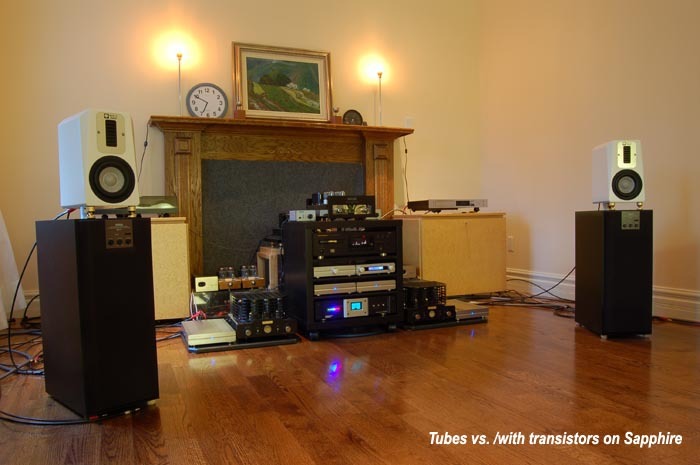 Either one of these tube power amps proved to be a perfect constituent of a wonderful crossbreed formula. The mix was just right. Vocals took advantage of the warm valve bloom. Timpani benefited from the tight control of NuForce's speed. Due to the monitor-grade resolution of the Sapphire (and all Mark & Daniel speakers for that matter), adding the right amount of tube warmth made things more palatable for the skeptics without losing the M&D identity. High-current class A/B? Or high-power class T? So far in my audition and apart from the sublime Symphonic Line, NuForce had demonstrated a clear advantage over other amps to become the most ideal match for Mark & Daniel in terms of control in the lower octaves and overall performance. But we shouldn't discard the good old class A/B amps. Symphonic Line for one is a solidly built, passionately voiced example. Unfortunately its price tag makes it a lopsided match. The amp that's been serving my Maximus-Monitor splendidly well is the affordable but now obsolete Sim Audio Celeste W-4070SE, another high-current class A/B muscle amp. The new Sapphire and Topaz are supposed to be much more amp-friendly. How low on current one could go becomes a legitimate as well as imminent question. While still in the class A/B camp, I pulled out my Thorens-Restek MMA-5 monoblocks to bi-amp the Sapphire. I apologize for these amps being obsolete models once again but at least I could check whether the Mark & Daniel speakers would swallow their humble output (50/70 wpc at 8/4 ohm) in one gulp without churning out a decent musical note. I had enjoyed far better outcomes from the Resteks with more easy-going speakers before. That leads me to believe that the only thing holding back these little monoblocks is their power supply restricted to a 50VA toroidal transformer and 3 x 4,700 uF capacitors per channel. 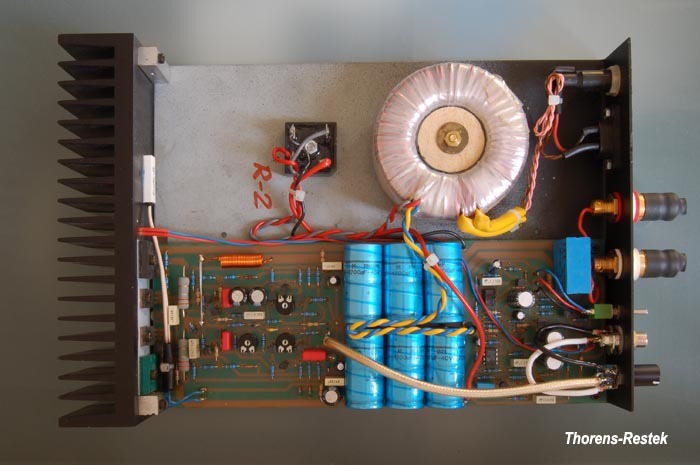 (As a matter of fact, I've always wanted to build an external power supply to crank up the Toshiba transistors.) Just to put things into perspective: the Sim Audio Celeste W4070SE is rated 70/140 wpc into 8/4 ohms but the power on reserve is amply backed by one 750VA toroid shared between two channels and 2 x 25,000 uF capacitors per channel. 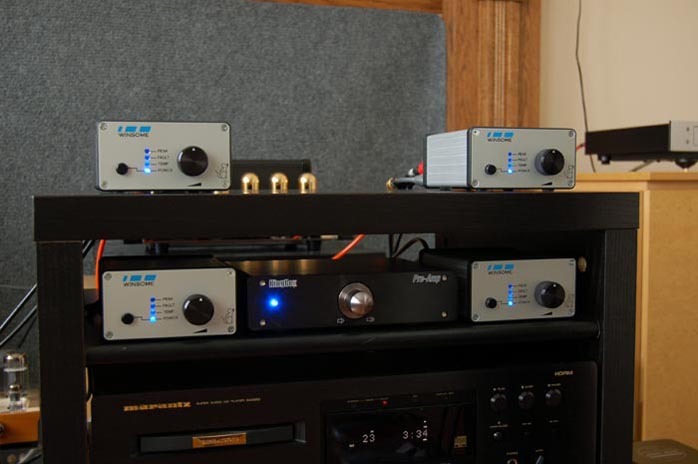 The Symphonic Line RG4 Mk III doubles that up to 150/300 wpc at 8/4 ohms, with 750VA/100,000 uF per channel. The indication is clear. To capitalize on the full potential of the Sapphire, there is still a certain minimum requirement in current reserves to shake up their heavier cone mass and stronger motor. Having said that, should I still try the Winsome Labs Mouse with the Sapphire? I warned myself to take absolute precautions, knowing my unsightly track record for frying T-amps - Trends Audio TA-10 (due to wrong battery polarity) and the KingRex (playing too loud driving the Topaz). 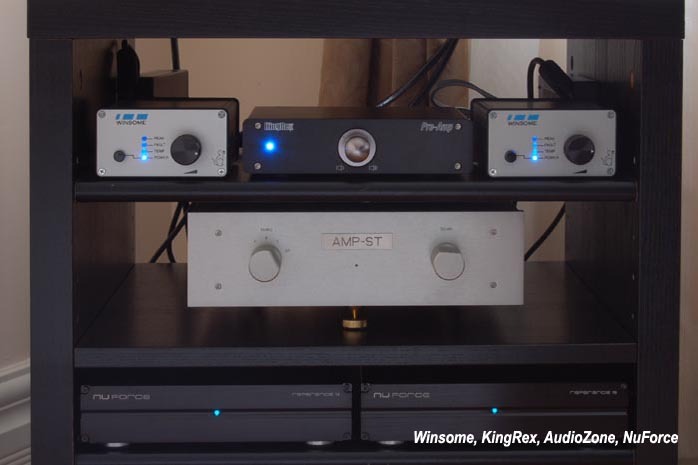 Jay Hennigan of Winsome Labs, who kindly sent me two Mice for bi-amping, did explain in his first email: "My amplifier is different from the Sonic Impact, Trend and similar units in that it utilizes a pair of TP2050 power stages and a 30-volt power rail. This gives sufficient current drive for good power and stability with four-ohm loads and sufficient voltage for decent power at eight ohms." That should have alleviated my concerns. Nevertheless, I still emailed Jay to get his consent before I fed the mice to the white cats. Jay's response was a confident "Go for it." The cats didn't kill the mice. Au contraire, they played joyfully together and became friends. (And we thought that only happens in Walt Disney or Pixar movies.) Even with a monstrous concert like Vangelis' Mythodea, the mice drove the Sapphire through every sharp corner with agility. I was pleasantly shocked. I didn't use any preamp. With volume knobs dialed to 12 o'clock, the mice were almost as potent as the NuForce, delivering nearly the same quantity and quality of bass. I bombarded them with the most unforgiving huge symphonic works and brass ensemble pieces without signs of stress or clipping, maintaining clarity and composure throughout. (There are explanations why this is possible in the upcoming Winsome Labs review.) With Mythodea and Brass Carmina Burana, the tonal spectrum was surprisingly well balanced. I merely wished for a bit more midrange presence. It was not hollow or sucked out but a little more oomph in the bassoons and tuba and a darker shade in the lower strings would have been even nicer. With the Beethoven Sonatas it was perhaps less sweet and suave in the upper octaves but not substantially so. Most surprising of all, the breath and depth of the soundstage and the layering details were so comparable to the NuForce amps that I had a hard time distinguishing the two. The three instruments in Arensky's Piano Trio were nicely separated and well proportioned. The solo voice rising above the layered chorus in Grieg's Choral Music was exactly what we'd call pinpoint imaging. Without consulting a gemologist, I tried to find out how these loudspeaker gem stones compared to each other and how they would alter my audio life. I have examined the Sapphire to quite an extent. Now I would refresh my memory of the Ruby and see how the Topaz stacked up against it since the price gap between the two is easy to cross. Obviously tempted by the more luminous new gems, I still have a soft spot for the Ruby. I have been using them in my piano room with the Micromega Microdrive + Deltec PDM Two + Micromega Variodac + NuForce Reference 9 for over a year. 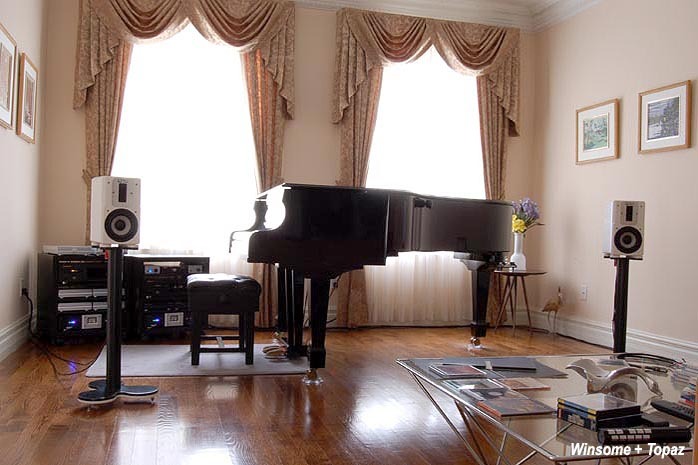 The lifelike reality of piano reproduction is surpassed only by the Maximus-Monitor. Both my Ruby and Maximus-Monitor are first-generation production as opposed to my editor's second generation Maximus. These older models have a certain ease and unrestrained spontaneity now that I had a chance to compare them with the new designs. They could hardly be called laid-back in the traditional sense but in the face of the Sapphire and the Topaz, they might be comparatively more reserved in a subtle way. Or call it more polished if you will. That might have had something to do with the Deltec PDM Two. So I replaced the digital source with the Marantz SA6820, upgraded the Reference 9 to the Version 2 and added the P-9 preamp. Resolution was definitely consolidated but Ruby being Ruby, she remained less calculatingly analytical and appeared to be always leisurely non-intrusive. I must have run her in well. To gauge how 'unfriendly' the Ruby was, I hooked her up to the KingRex Preamp and Winsome Labs Mouse. Beethoven's sonatas sounded very tube like. Imaging was almost like seeing through a soft focus lens (not my words but you know whose.) Forte chords were like drops of ink spreading out on blotting paper. I mean that in a positive sense because this kind of sound would appeal to a lot of people. The lower octaves were still well disciplined. I was surprised that the Mouse had the nerve to take the bass to such depth without any signs of fatigue. Mythodea demonstrated an expansive soundstage but resolution was compromised. After all, I was asking the Mouse to do the impossible. Time to move on to the Topaz. Partnered with the trump card NuForce setup -- Pre-9 + Reference 9 V2 -- the Topaz was a shade brighter than the Ruby in the highest octave (Beethoven sonatas). Bass was robust, tight and well layered (Mythodea). The trade-off in the lower frequency response (F3 of 48Hz versus 45Hz) was noticeable at first but soon forgettable due to the well-balanced tonal spectrum. The bass is nonetheless striking by any standard for a miniature bookshelf of this size. In a long room (28' 8" here), the bass energy should have no problem extending to the region of 35Hz at F6. Changing over to a KingRex Preamp + NuForce Reference 9, we got an illusion of deeper bass due to a warmer and richer midrange padded by airy ambience. Again the Winsome Labs Mouse produced the greatest marvel of all. Thanks to the lighter cone mass and higher magnet strength of the Topaz to speed up piston reaction and efficiency, the Mouse was able to pin down everything and all fell snugly into place. Accurate timing of phrase and rhythm, tight control of bass and articulation of details - you name it, it was delivered. Bearing in mind how the Mouse is humbly rated at 33/45wpc at 8/4 ohms while achieving 0.01% THD, the fact that it can drive the Topaz effortlessly and eloquently speaks a lot for itself as well as for the speakers. Both have come forward to forge an alliance of excellence, a coalition of non-conformists. And the Mouse retails for a mere $400. Mark & Daniel are very consistent in voicing their speakers so that they all speak with one voice regardless of size or price. The Ruby, Topaz and Sapphire are the three closest siblings in the family and you almost need to conduct a DNA test to identify them. Deciding on which model to get hinges on your choice of partnering amp. For those who already have a high-current amp or intend to invest in one, the slightly mellower Ruby is the most affordable option. For those who appreciate the sophistication of bi-amping and more articulated details, the Sapphire is ideal. If you prefer to travel light with the amp -- environmentally and financially -- you should definitely go for the Topaz. The choices seem clear. 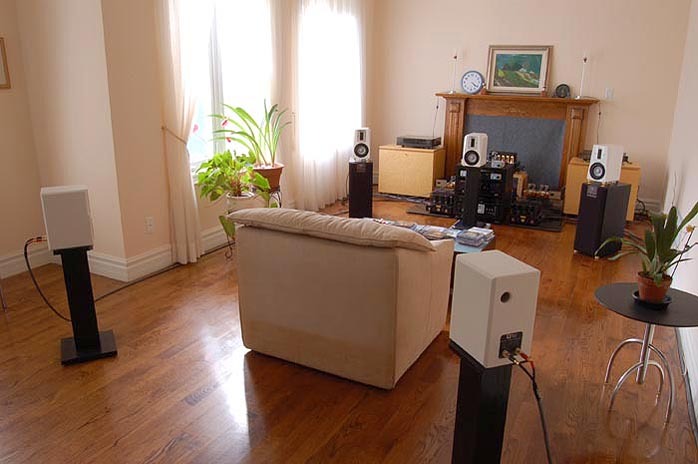 Since my first encounter with Mark & Daniel two years ago, I knew I could never go back to other humdrum speaker systems - except with small output tube amps and Tripath amps where I have my fair choice of high-efficiency speakers. I own a pair of Maximus-Monitor and the Ruby. I now decided to keep the Sapphire and I was thinking about the Topaz as well. My appetite for the M&D sound is getting insatiable. I want it in every room. I've always dreamed of setting up a complete 5-channel M&D system and these new gems prove to be the perfect contenders due to their amp-friendly nature. When my family planned for a trip to Hong Kong this summer, Daniel Lee suggested a quick detour to Shanghai where I asked him to sell me an additional single Sapphire to use as center channel. 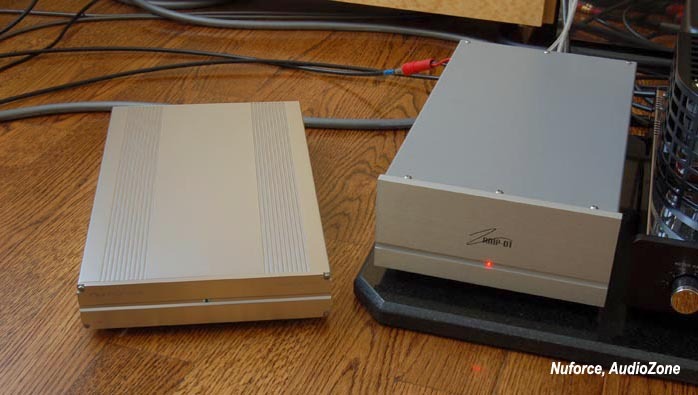 In Shanghai I had the pleasure of listening to the Apollo II driven by Mark & Daniel's A-400 amplifier. That was the most memorable audio experience I've ever had: my favorite and familiar M&D sound in insurpassable authoritative grandeur and soundscape palpability. You can imagine the satisfaction and excitement I had. Then I brought back the Sapphire for the center. I asked Jay Hennigan of Winsome Labs to loan me two more Mice. He gladly consented and expedited the delivery in no time (thank you so much, Jay.) I set up three Winsome Labs Mice to bi-amp the front and center Sapphires and drove the rear Topaz speakers with one Mouse. That is the best value 5-channel I could ask for and I don't miss a subwoofer at all. I shall report on that setup in greater detail in the upcoming Winsome Labs review. 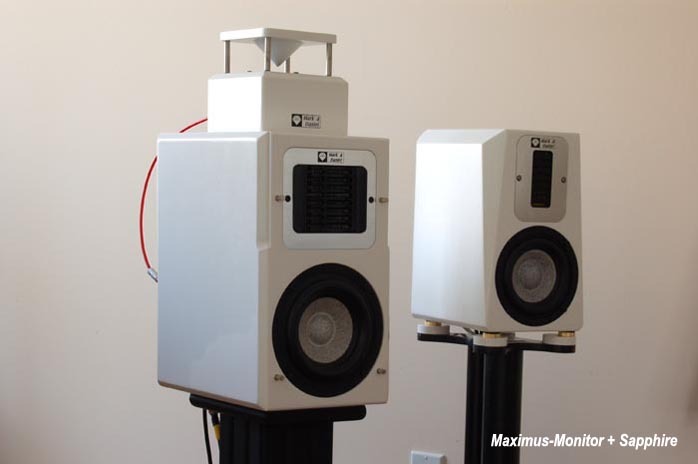 Mark & Daniel have rewritten two-way speaker design with their 4-C rules: Crossover point as low as 800/900 Hz (down to 600Hz for the Apollo II versus the 2,000/3,000Hz industry standard); Coherence of the full frequency range realized by the patented DREAMS wide-bandwidth tweeter and Super-X woofers; Clarity that surpasses the norm; and Cabinet architecture with sturdy compound marble that withstands intense internal sound pressures and is impervious to ultra-low standing waves. With their new precious stone models, the Sapphire and the Topaz, they have not only pushed clarity to a new benchmark but established a 5th C: Convenience, to widen the appeal and application of their innovative designs. These giant killers are no longer restricted to high-current power house amps. You can add warm atmospheric ambience and polished, silky overtones by partnering them to tube amps with output power as low as 18wpc. Or commemorate high resolution and transient speed with a robust yet affordable class T amp like the Winsome Labs Mouse. Quality of packing: Cardboard with solid foam cradles. Ease of unpacking/repacking: Entirely unproblematic. Completeness of delivery: Included magnetized grill stand-offs and grill for Topaz, full-size manual. Quality of owner's manual: Complete product line-up documentation, exceptionally informative, quality paper stock, full color quality printing. Website comments: Very informative and professionally done, Chinese or English language version available. Global distribution: Manufacturing plant in Shanghai, offices in the U. S., importers in Hong Kong, Taiwan and Canada. Human interactions: Professional and friendly, timely responses to questions, forthcoming about technical matters. Other: Black or white composite marble cabinets standard; custom finishes available for surcharge. Unlike wood veneers, these finishes are impervious to discoloring and far harder to scratch or damage. Pricing: Irresistible for the 5-C rules mentioned above. 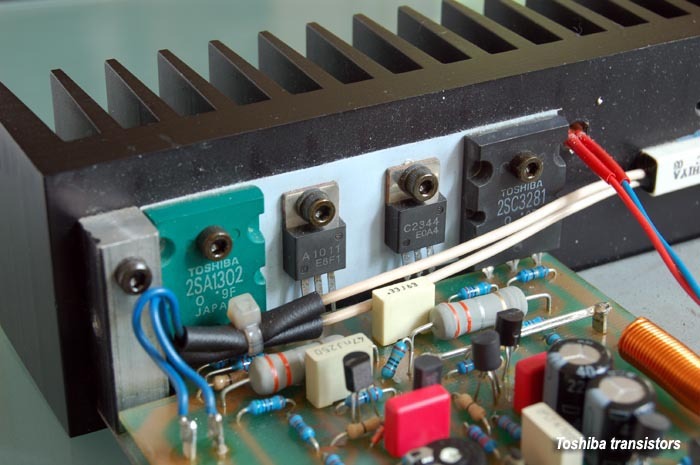 Application conditions: High-power amplifier with high damping factors are an advantage but no longer a mandatory. Rear porting requires some distance from the front wall to perform best. Placement favors large toe-in. Final comments & suggestions: Due to compact size, 28" speaker stands recommended. M&D's matching stands (with cable conduit) are perfect.